London, Ontario, August 16, 2018: The Western Fair is highlighting a fan favourite, the Demolition Derby for two Sunday’s (Sept. 9 & 16) in 2018. Typically a final Sunday staple of London’s fall classic, organizers brought the Derby back in 2017 to a packed grandstand. “We loved the response and wanted to celebrate an attraction that has become a tradition for many by offering bookend shows, one on each weekend in 2018,” said Heather Blackwell, Director of Urban and Rural Affairs. To celebrate its longevity you have to appreciate the story behind the adrenaline packed showcase, and to do that you have to tell the tale of the Williams family, who brought their act to the Western Fair in the 1960’s with an attraction called the Hell Drivers Stunt Show. The rest is history. Walter Williams knows the Derby business. An entertainer from birth, a businessman by trade, and a family man by heart, Walter and his twin brother, the late Bill Williams, have earned the title of Canada’s original motor sports entertainers and Thrill Show Production Inc.’s founding fathers through perseverance, integrity, and a desire to seek out unprecedented thrills. Their lifetime of entertaining began many moons before this, playing instruments, pursuing gymnastic tumbling, and combining acrobatics with roller skating. “I caught the entertainment bug at a young age,” Walter reminisces. “I was managing the old London Arena at the time and got to meet some famous people of the time, like Johnny Cash, and I think that is where the seed first got planted.” Their trampoline act The Magic Carpet, featured the boys balancing on a single pole 50 feet in the air. While sky high, they received their big break and reached new heights professionally, opening for the famous Harlem Globetrotters. Travelling the world led to many eye opening experiences, namely discovering an untapped entertainment market. Enter, the Derby. Walter fondly recollects, “(We) weren’t car buffs but when we saw what was being done with cars we thought there was a real opportunity there”. 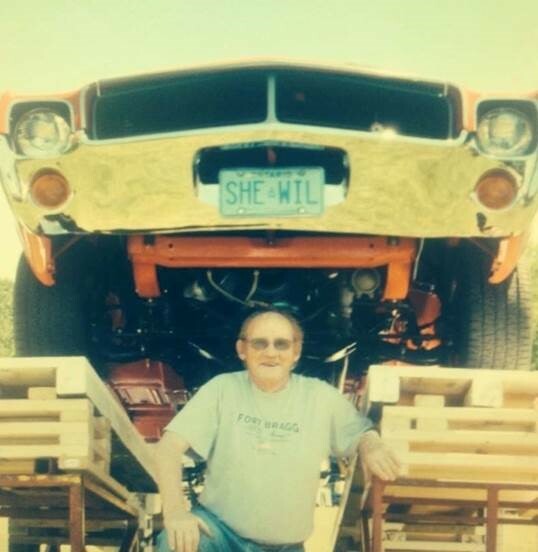 *Above image shows Walter standing below one of the 1969 Javelins that was part of the Trans-Canada Hell Drivers Show - taken on his 80th Birthday.